← My NewVIc Story: Amritpal Gill. ‘Collaboration between schools is now seen as an important way to improve educational performance yet little is known definitively about what impact this has for improving pupil attainment’. An interesting point which may well be worth looking into and luckily the Centre for the Study of Market Reform of Education (CSMRE) has done just that and we can read their report: ‘Collaborative overreach: why collaboration probably isn’t the key to the next phase of school reform’. The report asks some good questions, but unfortunately comes up with one of those bizarre inversions of common sense which sometimes emerge from over-reliance on dogma. It seems to show that collaboration isn’t all it’s cracked up to be. In summary, their conclusion is that we probably shouldn’t waste our time collaborating between schools because it’s not possible to demonstrate a quantifiable impact on the bottom line of exam results. This led to the TES headline ‘”No evidence” school collaboration boosts attainment’ (23rd October 2015). So that’s it then; research has proved that collaboration is a waste of time. Should we stop collaborating? To those of us who like to draw on the evidence of our own experience as well as that found in research reports, this proposition does seem a touch flaky. Is it really possible that all that all our well-intentioned professional co-operation is just a time-wasting diversion from the day job? Must we now quantify the benefits of sharing good practice? Do we have to demonstrate that learning from others, asking for or giving help make a measurable difference? Do we really need to make an economic case for professional dialogue and collegiality? Well, apparently we do. Tim Oates in his foreword to the report, rightly warns us against ‘uncritical reification of a single policy objective’ and ‘collaboration blind to the educational merit of the practices exchanged or created’ and we can all agree that collaboration isn’t much use if what is being shared isn’t much good. It’s also true that collaborating has opportunity costs. Running a teach-meet workshop or offering help and advice to teachers in another school all take up time which could be spent getting on with the your own job. No doubt every consultant who spends time asking a colleague in another hospital for a second opinion or attending a meeting on best clinical practice despairs at the time wasted; how many more patients they could have seen instead! 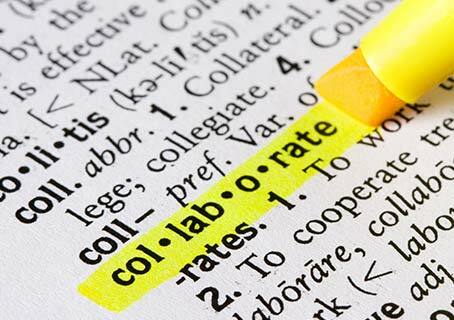 As we delve a bit deeper it becomes clear that the argument is about the level at which we collaborate. It’s not so much that we don’t know whether collaboration is a good idea, it’s just that collaborating with your competitors undermines the market. After all, would Tesco choose to share good practice with Asda? It turns out this debate is actually about the danger that system-wide collaboration might undermine inter-institutional competition. It seems that the Centre for the Study of Market Reform of Education is actually more of a ‘Centre for Advocating the Marketisation of Education’ and that they are worried that those nice teachers might be a little too keen on helping the enemy and not be committed enough to the trench warfare of competition. The report starts from an assumption that the benefits of collaboration are taken too much for granted out of a rather wooly attachment to ‘a particular conception of the public service ethos’. But its own starting point is an attachment to an even more shaky conception, one which requires more competitive, marketised provision and where there is no public service ethos and no idea of public good beyond the attainment of your students and the success of your school or possibly the chain it belongs to. All that matters is learner and teacher performance and the best way to drive this up is competition between providers. Shades of an ‘uncritical reification of a single policy objective’ perhaps? This amounts to the enclosure of good practice which may be a forerunner to its commodification, as in: “we have developed some great new teaching methods and now we’re going to sell them to you”. So, by all means let’s make sure that any collaboration we engage in is mutually beneficial and that the good practice we share really is good. And if there really is insufficient evidence that students benefit from teachers collaborating, let’s test the hypothesis properly. But let’s also be clear that our outlook on this issue will shaped by our ideological starting point. If you want to see a universal public and democratically accountable system, you will probably take the view that demonstrably beneficial collaboration should have no boundaries, as in: “share what you know and what works well because the more people benefit the better it is for everyone”. This is the free market of ideas at work while the ‘reformers’ need to watch out they don’t end up defending restrictive practices and professional closed-shops. There are clearly shades of grey between these poles but research which is so obviously predicated on one ideology is unlikely to convince those committed to the other. This entry was posted in Education, Education policy and tagged collaboration, competition, CSMRE, Education, education system, marketisation, partnership, research, schools. Bookmark the permalink.